From left, Gov. Dannel P. Malloy, transportation Commissioner James Redeker and Don Shubert, head of the Connecticut Construction Industry Association. Gov. Dannel P. Malloy continued to set the stage Wednesday for a landmark 2018 transportation finance debate, outlining nearly 400 capital projects worth $4.3 billion that would be suspended over the next five years because of inadequate funding. 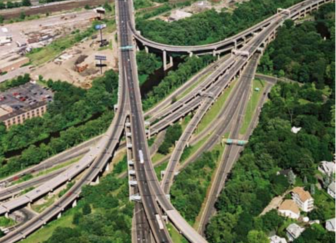 The alternative to deferring upgrades to the elevated section of Interstate 84 in Hartford, the “Mixmaster” junction of I-84 and Route 8 in Waterbury and hundreds of other priorities. the governor and other advocates argued, is for legislators to dedicate more resources to a Special Transportation Fund on the fast track to insolvency. 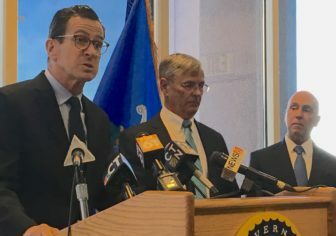 “If Connecticut does not take the necessary action to allow us to restart these vital projects, not only will it put the state’s infrastructure into a further state of disrepair, it will hurt our economy,” Malloy said during an afternoon press conference at the state office building on Columbus Boulevard. The governor, who has refused to say whether he will recommend tolls, gasoline tax hikes, or other revenue-raising measures when he presents his next budget to the legislature on Feb. 7, continued to play his cards close to the chest Wednesday. “The plan will be announced when it is announced,” the governor said, later qualifying that to say it would be released before the end of January. But he did hint he would consider an incremental approach and possibly recommend extra funding to sustain the transportation program for a few years — as opposed to decades. “I’m trying to gauge the legislature’s appetite to do the right thing,” Malloy said. And in a legislative election year, a more modest proposal might attract more support than a major revenue ask from motorists. Department of Transportation Commissioner James Redeker said his agency already has suspended eight projects with a projected collective cost of $27 million. Another four projects costing a total of $277 million — including an upgrade for the Charter Oak Bridge linking Interstate 91 with I-84 and Route 15 — would fall into limbo in April. About 133 projects costing $1.1 billion are projected to be indefinitely on hold — absent more funding — when the current, two-year budget cycle ends in June 2019, Redeker said. The I-84 and Rt. 8 interchange in Waterbury. And Malloy also said capital projects aren’t the only part of the transportation program that are at risk. Redeker said bus and rail fares could increase this calendar year, and preparations for February public hearings on these matters need to begin as soon as next week. The DOT also has warned that it may need to reduce service on the entire Shoreline East rail line and weekend service on MetroNorth’s Danbury and Waterbury lines. But the head of the Connecticut Construction Industry Association, Don Shubert, said a major contraction in the state’s transportation program could cause hard-to-reverse damage to a construction industry already in retreat. “The construction industry is not geared up for fits and starts,” Shubert said, adding that Connecticut already has 1,000 fewer construction jobs than it had one year ago, and employers are struggling to overcome a “skills gap” with the workers they can find. If the state dramatically curtails transportation construction, “We can’t just snap our fingers and get started right away,” even if legislators then reverse that situation. 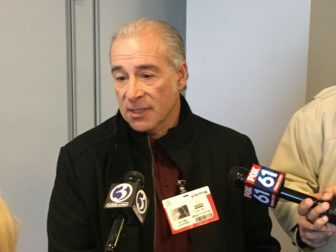 Connecticut already has lost construction workers to competing industries in New York and Massachusetts, he said, adding that local contractors also are looking at moving their businesses elsewhere. Despite that threat, Rep. Tony Guerrera, D-Rocky Hill, House chair of the legislature’s Transportation Committee and an ardent supporter of restoring tolls, declined to predict whether legislators would support this revenue-raising option — or any other — in a state election year. Senate Republican leader Len Fasano of North Haven said Wednesday that Malloy should not be surprised by the transportation fund’s fiscal woes, saying the governor and Democratic majorities in the legislature diverted funds away from transportation on several occasions between 2012 and 2015. The governor said the state continues to do basic maintenance on roads, bridges and rail lines, but ultimately, a lack of funding will affect all aspects of the transportation program. “Bridges fall down. It happened once in Connecticut,” Malloy said in a reference to the 1983 collapse of the Interstate 95 bridge over the Mianus River, which claimed the lives of three motorists. The Malloy administration warned Wall Street credit rating agencies in November that the new state budget short-changes the transportation program. Absent more funding, that program is headed for dramatic contraction over the next five years. The Special Transportation Fund, which holds about $1.51 billion this fiscal year, represents about 7 percent of the overall budget. It chiefly is used to cover debt payments on transportation-related borrowing and Department of Transportation operations. The governor, who proposed a 30-year, $100 billion program to rebuild Connecticut’s transportation system in February 2015, has had limited success since then securing resources for the program. Most of his time has been spent pressing for resources simply to keep the transportation program financially afloat. Lawmakers agreed in the spring of 2015 to dedicate a portion of sales tax receipts to transportation. This was deemed the key to funding the first five years of the program, through 2020. Much of the new capital spending in the first five years is focused on planning major projects.